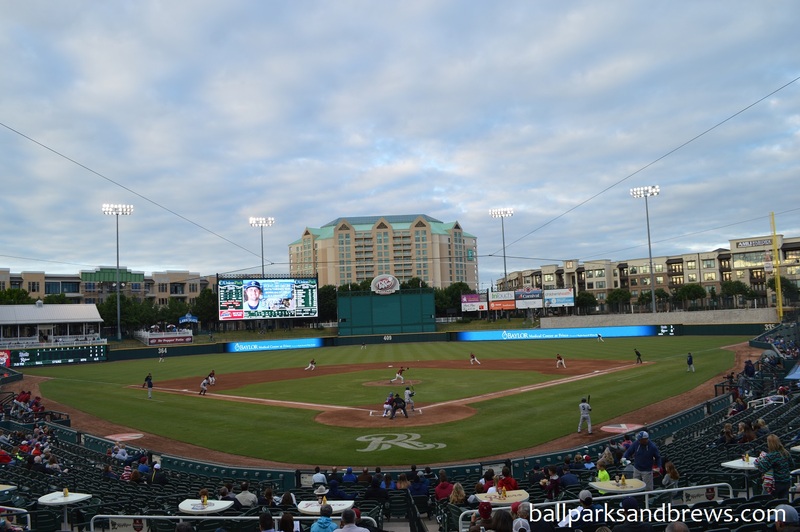 Ballpark Basics: Unusual aspects make this one of the most unique ballparks in all of baseball. Walking up to Dr. Pepper Ballpark you might mistake it for an apartment complex. Covered in gray vinyl siding the ballpark could be confused for a suburban apartment complex. Even after entering the ballpark, each suite is housed in what looks almost like a beach cottage. It is one of the more unique structures in MiLB. We caught a game there in the beginning of the 2016 season. It was before the feature of the ballpark that has received the most attention was completed: the Choctaw Lazy River! 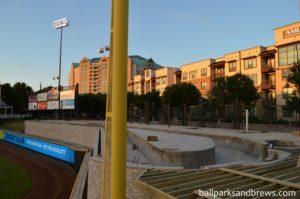 Just over the right field wall sits a 400 foot long lazy river that offers one of the most unique views in all of MiLB. The lazy river replaced a pool that used to sit in its place. Floating in water is a great way to beat the Texas heat while enjoying a game. 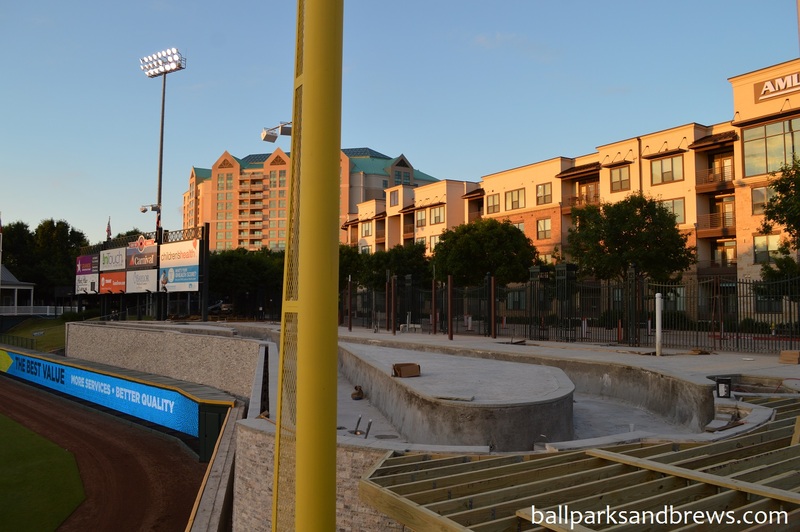 There are plenty of areas for groups to congregate at Dr. Pepper Ballpark. On top of the already mentioned lazy river, there is the Diamond Deck and Dr. Pepper Patio in left field as well as party decks on either side of the suite level. Berm seating is another area for large groups to congregate and it fills up most of the outfield. BEST PLACE FOR BEER: In the left field corner is where you will find the the Bull Moose Saloon. 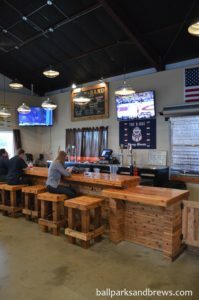 Here you will find a wide variety of local and craft beer, including RoughRiders Red Ale, a beer created specifically for the RoughRiders by Franconia Brewing Co. The Bull Moose Saloon also offers something that we have not seen in any other ballpark: flights! That’s right, you can get 4 samples of any of the beers on tap. 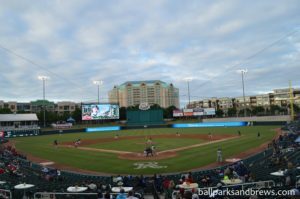 From the look of the ballpark, to the craft beer options, to the lazy river Dr. Pepper Ballpark offers many different aspects to your typical ballparks. However, these things do not distract from the play on the field and simply add to the enjoyment of taking in a game at Frisco. 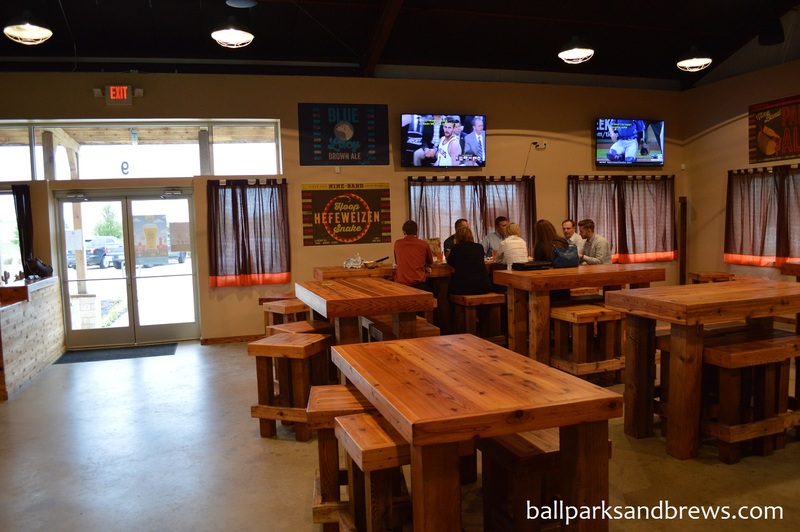 Brewery Basics: A great local place that is proud of its roots. We had a great time in Frisco, we left our tour of the ballpark and headed to Nine Band for some pregame activities. 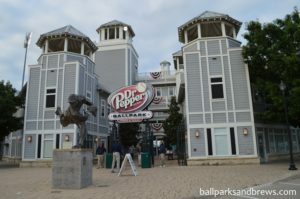 The guys here were just as friendly and welcoming as the ones we’d met at Dr. Pepper Ballpark and knew a great deal about the brewery and Texas history and lore. Dan the bartender was happy to meet us East coast outsiders and made us feel part of the group. We sidled up to the bar and joined several local Nine Band fans who were vociferous in their love of the place. The bar area is basically one big, open square room, with the bar taking up the left ⅔ of the back wall. They’ve got tables if you’re not in the mood to be a barfly, and TV’s that, on our visit, had the Cubs on; and we were happy to find fellow fans even in Rangers territory. 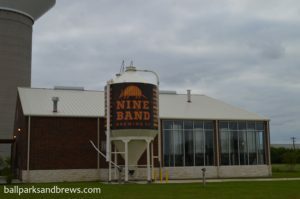 They have great logos for everything (and this was our one dislike – we loved the place and wanted to take home a pint glass souvenir, but with a hefty 13.99/per price tag, we chose to leave Nine Band out of our collection). 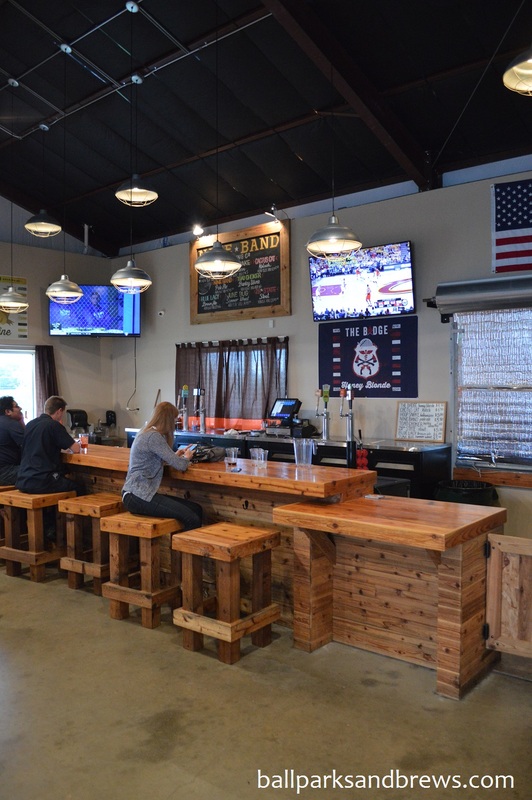 The cliche that “everything’s bigger in Texas” actually held true here, the thick wooden tables and matching bar are complemented by big colorful block taps and for $6 you can get four big pours in a flight so we chose from the eight on tap. 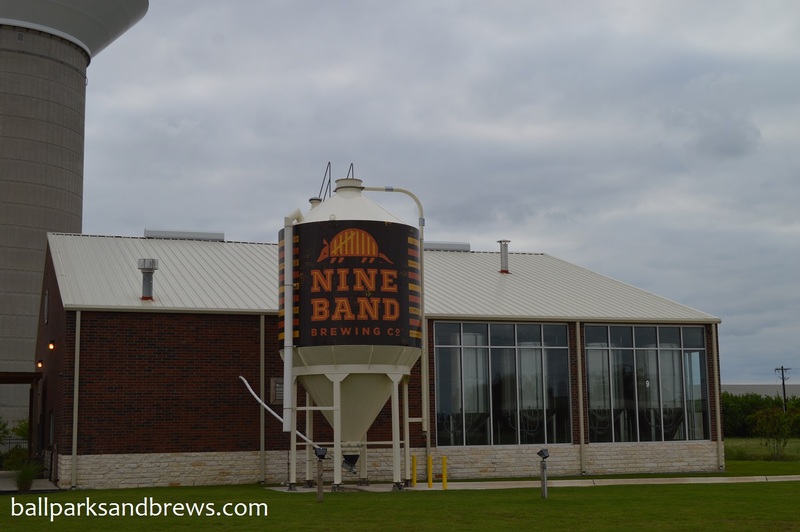 Nine Band is name for the number of stripes on a unique-to-Texas armadillo’s back, and likewise each of the beers have locally relevant chosen names. You can read the story of the name on their beer cans, or just stop in for a visit and ask the bartender. June Bug Summer Wheat – 5.3 ABV/14 IBU – This beer pours a hazy peach/mango orangey color, that is yellower when there’s less in the glass. It’s sparkly but very sweet to our taste and reminded me of an orange soda, while Jim thought “froot loops”. Lacy Brown 6.1 ABV/23 IBU – Named for the state dog, the Blue Lacy. This American brown ale has a sweet malt, sugary smell that is also representative of the taste, it’s almost like an imperial in that way. A slightly clouded red-brown color. 28th State Stout 5.6 ABV/23 IBU – Thick dark chocolate color, and a ring of head. The aroma is roasted and coffee and the palate complex. What starts as well rounded coffee malts has a swirl of dark caramel and even a hint of anise licorice at the very end. Toad Choker – 10.6 ABV/87 IBU Dan asked “Wanna knock your socks off?” The Toad Choker (for non western speakers like us, this is colloquial for “a sudden, heavy rain”) is similar in color to the brown, in that it’s a hazy true brown color with amber notes. Smells bready with touches of raisin and currant. Despite weighing in with a high ABV, the taste is tangy upfront and strong, but blended. The higher IBUs help control the flavor, so you note the alcohol without it being overwhelming.